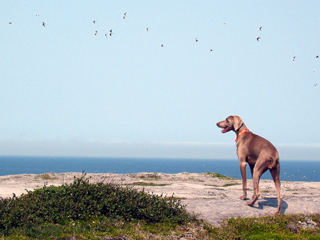 We’ll add more Newfoundland hikes as we complete them. There are just a few more pictures to be added to those we’ve done. From now on we’ll just be adding new trails as we do them, and perhaps adding trails suggested (and written up) by our site visitors. We can certainly use your help with this. Any additions from visitors will be fully credited. Please help our site grow as a source of information for visitors to the province. 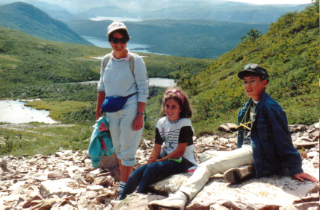 If you’re only going to be in the Gros Morne area for a few days, and you can only do two or three hikes, we’d recommend the following: Western Brook Pond, Lookout Trail (Discovery Centre), Green Point. If you’re in good enough shape to do the James Callahan Trail (Gros Morne itself), then by all means do that. For activities in those three days: The Western Brook Pond boat tour, Theatre Festival at Cow Head, the Discovery Centre on the South Side of the Park together with a trip to Trout River and a meal at the Seaside Restaurant. There’s been a lovely music program (mainly classical) being run in Rocky Harbour all summer. You may want to take that it. This is the second year for that and it’s had tremendous success and rave reviews. 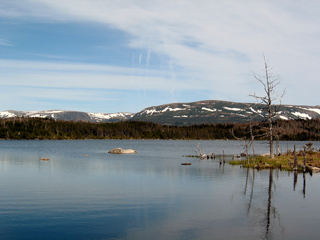 Western Brook Pond – This is the first trail we hike in the spring, and the last one we hike in the fall. 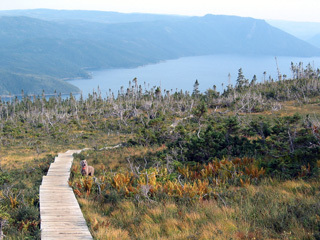 It leads to Western Brook Pond and its magnificent fjord. It’s a relatively easy hike, taking about a half hour to forty-five minutes each way. There’s a boat trip up the fjord that you may choose to take. You’d have to make reservations for the boat trip before you go in there. The boat trip is worth it. 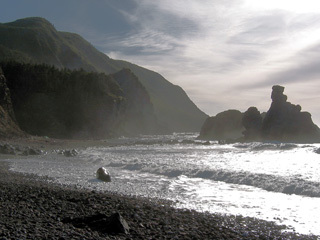 Gros Morne is a geological wonder. The boat trip highlights why it is a wonder. 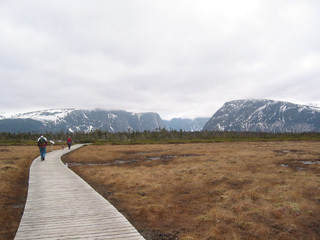 About three quarters of the way in to the pond, you’ll be offered the choice of taking a slightly longer option that will lead you along a portion of Western Brook itself. You may do this either coming or going. If you have the time, do it on the trip IN to Western Brook; it’s more interesting that way because you have the view in front of you all the time. 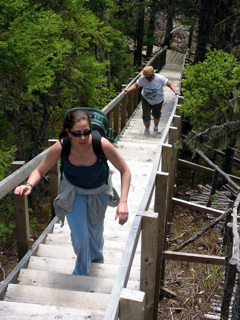 The trail is fairly wide with lots of boardwalk and only a short, gentle incline or two. Sneakers would be fine. Anyone who can walk downtown for an hour and a half could easily take this hike. For the more adventurous, the boat can drop you at the head of the gorge and you can do a three or four DAY traverse of the mountains. (We haven’t done this, so we can’t comment on it one way or another. Just don’t choose lightly to do this. You’d need good mapping skills, and you’d have to be in superior condition. Conditions on the mountain can change very rapidly.) As I’ve said, we do this trail in the early spring and in the late fall. At other times the trail can be quite crowded because of people taking the boat tour. We prefer to have the park to ourselves. We’re spoiled. Green Point Green Point Trail is actually a stroll along the coast. It’s quite pleasant, can be windy at times. You have the ocean on one side and the fjords of the Long Range Mountains in the distance on the other side. There are a few small ponds that are occasionally visited by ducks and geese. 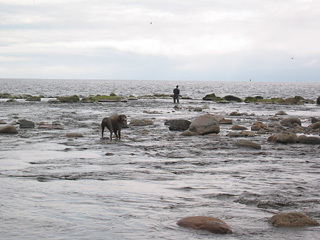 At the mouth of Baker’s Brook at one end of the trail you will frequently see fishermen after sea trout. It is actually possible to hike just one way on this, as both ends of the trail are at the highway. (Well, one end, the Green Point end, is in the camp ground just off the highway.) But to do this, you’d need someone to drive and pick you up unless, for some insane reason, you’d choose to walk up the highway. This is a nice spot for a picnic. Usually we drive to the campground, park the van in the trail parking spaces, do our hike, then, when we come back, park the van in one of the empty campsites and have our picnic. We’ll take some snacks on the hike with us. This is as trail we do several times a year. Carol likes it. Alexander Murray Trail – Step, steps, and more steps. This is beautifully prepared trail, a little rough at the back end (going clockwise), but a great hike. It will take you two to three hours. You could build a town with the amount of lumber used on this trail. The top of the trail will see you overlooking Green Bay. There’s a great little spot there to eat your sandwiches and your oranges. Bring lots of water. Sneakers should to it for hiking. The dogs had no problem. When we did this hike, daughter and Myla the Boxer were with us. It was a lovely day. The whole Green Bay area is lovely to explore. Later this year we hope to take the ferry to Little Bay Islands and do some of the trails there. Point Riche Lighthouse Trail – This is not so much a trail as a stroll along the coast. The trail is “marked” only where needed by small boulders laid out in a line. You don’t really need them, but they’d come in handy if the fog rolled in quickly. The rock formations are interesting. The trail leads to an archeological dig. 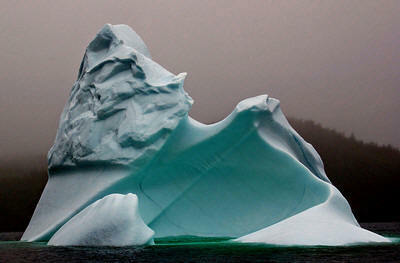 Archeologists claim that every archaic group that ever lived in Newfoundland lived on this site at one time or other. Sneakers will do for this. Any amount of time would suffice, even fifteen or twenty minutes (up to perhaps two hours). You may turn around at any time. Burnt Cape – I don’t think this is really a hike, but it was a great hike. Around the Harbour from Raleigh where we visited Abiel Taylor’s craft (carvings) store, is the road to Burnt Cape. It’s not a road I’d like to take a car over, even though they do it regularly. We parked out car at the start of the road, just at the bottom of the hill, and hiked to the Cape. This trail is noted for its extremely rare flowers. There’s a natural botanical garden there, with little plants tagged and staked. 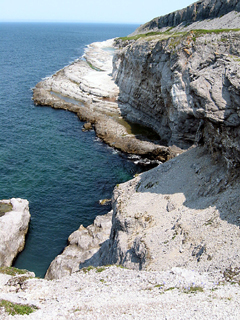 The hike is along cliffs along the coast. At the end of the road you’ll come to a couple of magnificent sea caves. You’d need a boat to get a good view of them. The hike is an easy one, but long. It will probably take you two hours round trip, especially if you take the time to smell the roses (or whatever the rare flowers are). We took a lot of pictures of the various plants we found along the way. (Look at the “flora” link in our Photo Gallery). Piqa loved the hike. She was taunted along the way by a couple of ravens. Maybe they were trying to lure her off the cliff. 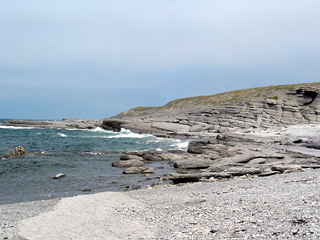 The Gravels – This is at the beginning of the Port Aux Port Peninsula (a few kilometers from Stephenville). 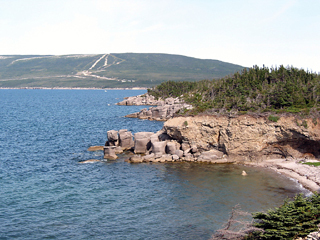 It’s a lovely stroll along the coast of the Port Aux Port Peninsula. It was still under construction when we did it in 2003, so I can’t tell you just how far it goes or how long it actually it. It’s a nice walk, not challenging, and you can go as far as you want and turn around. It wasn’t a loop when we did it. 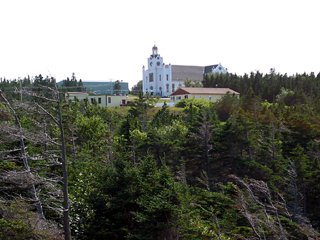 Near the end of the hike you will find an historic church and an associated museum. We visited that by car a little later, and I’m not 100% sure it’s accessible from the trail, but I’m pretty sure it is. This is the kind of trail you’d do if you just want to get out of the car and go for a walk to stretch yourself out a little. There are picnic tables at the beginning of the trail. We had a snack there, but they’re very close to the road so there’s a fair amount of traffic. 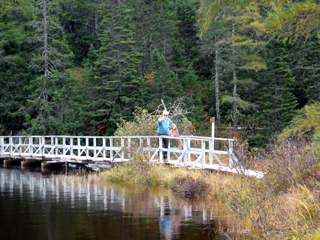 Sandy Pond – Terra Nova National Park – This is another trail you’d like to do just to get a break from your drive. There are several like this in Terra Nova National Park. 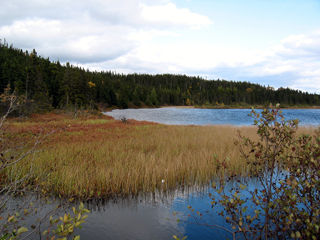 Sandy Pond is a kilometer or two off the highway (paved road). There’s a lovely little pond where you could also go for a swim. It’s pretty busy in the summer, being one of the few places campers can take their children for a safe swim in relatively warm water. The trail goes around the pond and will take you about 45 minutes if you take your time. It’s an easy hike. Sneakers will be fine. Go for a swim when you’re finished. We find this a nice break when we’re on our way to St. John’s. 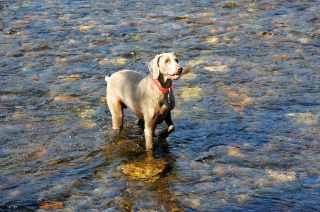 Piqa likes it because she can do her two favourite things, run and swim. She can also eat moose poop. The Canada Jays are saucy; bring something for them to eat or they’ll pick your pockets. There’s another trail in Terra Nova that we do just for a short stop on the way to St. John’s. It’s along the coast. It’s called the Coastal Trail to Headquarters Wharf. We start at Salton’s Brook Marine Centre (an interesting place to visit). You can also start at the other end, Newman Sound Campground. You can go just about as far as you’d like and then turn around. It’s a nice little break for Piqa, but we don’t enjoy it as much as Sandy Pond, but folks who like the coast may enjoy it more. Berry Hill Pond and Berry Head Pond – These are two very similar hikes. They’re in proximity too. Berry Hill Pond trail leaves from Berry Hill Campground, just north of Rocky Harbour. It’s a pleasant hike (about 45 minutes) around a pond with a prominent beaver lodge about half way around. 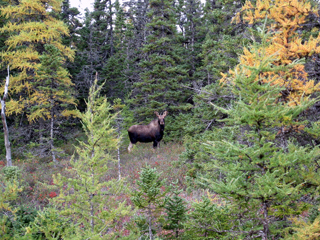 You may see moose on this hike. Berry Head Pond is just a little further north on the highway. Again, it will take you about 45 minutes. There’s lots of boardwalk. Sneakers will suffice for both of these. Spring or fall is the best time. There may be lots of mosquitoes and/or black flies in the summer. East Coast Trail – There’s a remarkable project underway on the East Coast that I can’t say very much about. 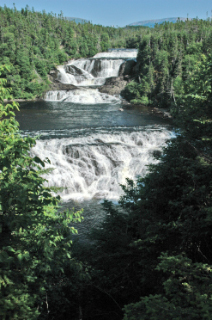 The aim of the project is to connect 520 km of trail. They have 220 km completed. They have maps of each of the 18 “paths.” We’ll be doing at least a part of at least one of those paths the next time we’re in St. John’s. In the meantime, you may want to visit the East Coast Trails website. 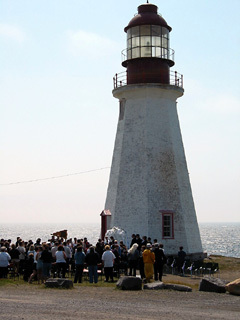 Bay Bulls to Witless Bay – Well, actually, we did it the other way around. 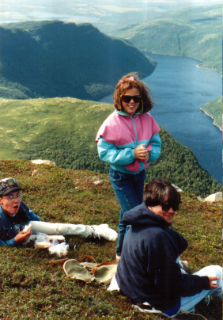 We drove the van to Bay Bulls, parked it, and my sister drove us to Witless Bay so we could hike back to the van. It was a foggy day in the middle of a hot, muggy week. If this trail is indicative of other completed paths, then this is an impressive project. It is a seven kilometre hike. The trail is fairly easy with only a few short climbs over headlands, and only a few roots to dodge as you trek through the woods at the Bay Bulls end of the trail. Sneakers OK. Hiking boots better. It took us about two hours and forty five minutes. We took a lot of pictures and stopped for short snacks. My new camera got a workout looking down over the numerous coves, punctuated by sharp cliffs and deep inlets biting into the shore. Through the fog we could hear the sounds of tour boats and tourists seeking commune with nature and the whales. All this to the sound of Newfoundland traditional music from the boats. Some like it I guess. One high speed zodiac came zipping into one of the coves, killed its motor for a moment and let the passengers hear what we heard. Nothing. Nice. There are maps available of all eighteen of the completed paths. 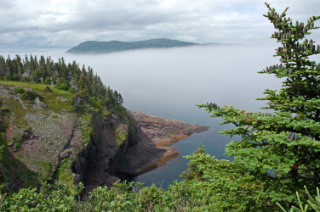 We’ll add other sections of the East Coast Trail right here as we do them. If we go to St. John’s in September we’ll do another section or two. There is a detailed description of our hike of another portion of the trail (La Manche) in the Hikes of the Weeks section. Say “Hi” to people on the trails. They’re very friendly, even if they’re not Newfoundlanders. If you’re on the coast or on the mountain (Gros Morne), watch the weather carefully. Fog can roll in very quickly, and the weather can change very quickly. If you get lost in the fog, stay put! Actually, that’s a good policy if you get lost anywhere. Most days it’s a good idea to dress in layers. Walk softly and carry a big stick (hiking stick). Carry water appropriate to the hike; carry snacks appropriate to the hike. Don’t overburden yourself. Plan. Think. You’re not going to get universal cell phone coverage in Newfoundland, but cell phones are good. There are also lots of dead spots for GPS, but a GPS is good. If you’re hiking in the early spring or late fall, stay off any ice you may come across. There are rabid fox on the Northern Peninsula and they may be migrating across the province. There are bear on the trails. They’re not cuddly. You probably won’t see one. There are lots of moose on the trails. They’re generally not afraid of you and won’t react to your presence (especially in the park); however, they’re a big, dangerous animal. They have been known to attack, especially during the rutting season. Don’t bother them. Don’t be afraid to ask for directions/help. Newfoundlanders will probably take you home and feed you if you need it. We’ll want to find out if in some way you’re related. Hiking boots are always preferable to sneakers. Sandals don’t make for good hiking. Mosquitoes and black flies can be bothersome; Skin So Soft does work, but something with DEET is better. Wear light coloured clothing. Don’t use perfumes/colognes. Don’t drink and drive; don’t drink and hike; don’t drink and boat; don’t drink and hunt. Wait ’til you get back to your cabin/motel room/tent and drink all you want. Have one for me. Anything you bring in, bring out. “Take nothing but photographs; leave nothing but footprints,” and don’t leave them in the wrong places. Enjoy your stay in the greatest place in the world amongst the friendliest people in the world.